Posted on Tue, Mar 13, 2012 : 1:54 p.m.
A resident of the Arbor Meadows neighborhood of Pittsfield Township noticed people looking into vehicles early Tuesday, raising suspicions about the reason. That resident called police - and minutes later, following a chase, three people were taken into custody for multiple auto break-ins. 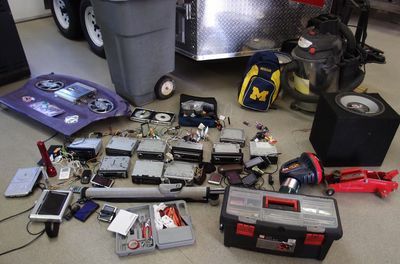 Some of the items recovered after the early-Tuesday break-in spree in Arbor Meadows. "They contacted dispatch and let them know someone was looking in cars," said Sgt. David Thomas. "It was a big help." The incident unfolded in the manufactured home community located at Michigan Avenue east of US-23 just after 3 a.m. Tuesday. The caller told a police dispatcher that four people riding in a blue car were approaching multiple vehicles in the parking areas, getting into at least one of them. Patrols arriving on the scene had descriptions of the people, all of whom tried to run away when they spotted officers. Two were caught inside the complex, another was apprehended nearby and the fourth escaped. However, police said he's been identified as a 22-year-old Downriver Detroit resident and faces arrest. The suspects - two men, ages 17 and 18, and a woman age 19 - were also all from various Downriver communities, police said. Detectives from those areas have been in touch with Pittsfield, said Deputy Chief Gordy Schick, to determine whether the suspects have been involved in similar crimes elsewhere. The suspects' car contained multiple items taken from several vehicles, police said. The items include electronics like GPS devices and iPods, and about 10 car stereos. By early afternoon, it was still unclear how many vehicles had been affected. Multiple calls from victims have been received since morning, police said, and they expect more calls. "We don't have a total count yet," Thomas said. Schick added: "We think we're still going to have more victims." Anyone who believes they were impacted by the crime spree should contact Pittsfield Police at (734) 822-4911, he said. Investigators also still were determining more information on the suspects, Thomas said. It was unclear whether they had previous criminal records. It's also unclear how they targeted Arbor Meadows for the thefts. "The only thing we were told is they were just heading out this way," Thomas said. Thu, Jun 7, 2012 : 11:17 p.m.
That's the way to do it!! Citizen alertness and participation is vital to crime control! The cops are only as good as the citizens who support them. Tue, Mar 13, 2012 : 7:26 p.m. I do have additional info on the hometowns: Two are from Brownstown Township, one is from Taylor and one is from Dearborn Heights. Tue, Mar 13, 2012 : 7:04 p.m.
Tue, Mar 13, 2012 : 6:23 p.m.
Another job well done by the Pittsfield PD! The best police department in the county.